A surprise message from Istanbul is about to ruin Captain Haddock's day. Named as sole beneficiary in the will of his late comrade Paparanic, Haddock sets sail with the intrepid Tintin on a journey to collect his strange bounty – but is all as it seems? Aided by their friends – including the eccentric Professor Calculus, Snowy the dog and the bumbling Thomson and Thompson – Tintin and Haddock are soon confronted with slippery lawyers, ex-pirates and dangerous gangsters in an action packed adventure set in the exotic locations of Turkey and Greece. 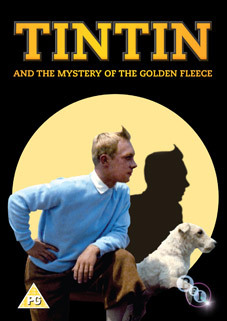 Jean-Jacques Vierne's 1961 Tintin and the Mystery of the Golden Fleece (Tintin et le mystère de la Toison d'Or) is one of the few adaptations to meet with Tintin creator Hergé's approval. As well as uncanny Tintin look-alike Jean-Pierre Talbot's martial arts skills and the larger-than-life Georges Wilson as Captain Haddock, the film features the talents of other established character actors including Marcel Bozzuffi (The French Connection) and Charles Vanel, famed for having the longest career of any film actor (Henri-Georges Clouzot's Les Diaboliques, The Wages of Fear and La Verité, and Hitchcock's To Catch a Thief). Tintin and the Mystery of the Golden Fleece will be released on UK DVD on 3rd October by the BFI at the budget price of £9.99, just ahead of the much publicised big screen outing for the boy reporter in Steven Spielberg's The Adventures of Tintin. No extra features will be included.